Adventurers Backpack brings to the table 13 new classes, mountains of spells for all classes, counter spells and spell duels, a fresh easy-to-use approach to unarmed combat, war mounts, rune magic, and a new look at pole arms. But more than that, Adventurers Backpack delivers a new, innovative approach to equipment and equipping your character. There are 34 unique backpacks complete with all the equipment your character will need! Each backpack comes with cost, weight and encumbrance value. The backpacks cover it all. There are class-based backpacks for all character classes, general purpose backpacks for dungeons and overland, and special purpose packs such as the medic or dungeon mappers pack. Equipping your character was never so easy. 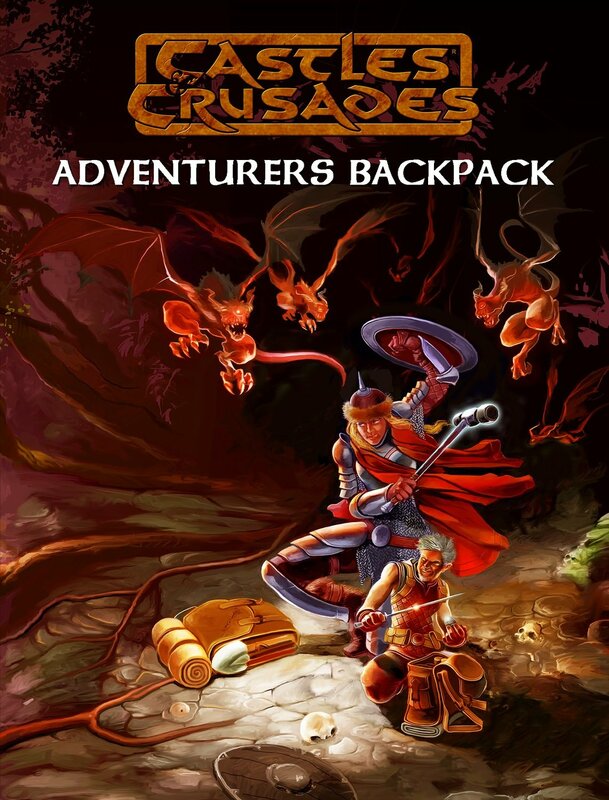 Adventurers Backpack brings a whole new dimension to your Castles & Crusades game!